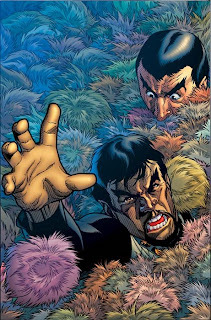 When we did our last round of STAR TREK: ALIEN SPOTLIGHT issues, we skipped over my favorite race... the Tribbles. In March, we rectify that with "The Trouble with Humans," a one-issue spotlight on the little hairy Klingon-hating 'sacks, courtesy of Stuart Moore and Mike Hawthorne (new artist on G.I. JOE: ORIGINS). The cover image here is courtesy of David Williams and Moose Baumann. Awesome! The trouble with tribbles is one of my favorite episodes from the original series. Looking forward to this one! I thought I remember you mentioning a Klingon Spotlight as well, does this mean a whole new series of one-shots? >I thought I remember you mentioning a Klingon Spotlight as well, does this mean a whole new series of one-shots? It does, yep. KLINGONS with painted art by J.K. Woodward, a Q story written by Scott & David Tipton, and some others, too. I love TOS-style Klingons. Thank you very much, Chris, for providing us Star Trek fans with some FANTASTIC comics!